No, I did not get another kitten LOL (though kitten season is beginning and I should have new fosters soon). No, the fabulous Darcy Ashton got a new kitten, and made the most amazing pattern! 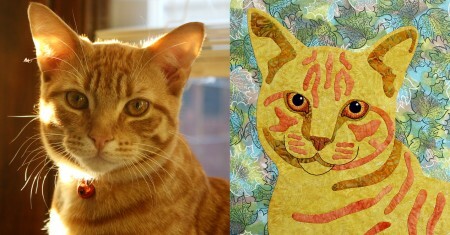 Pumpkin Jr., side-by-side with his fabric rendition. Darcy is famous for her blanket-stitched appliqués, and this is an example of her more realistic work. I’m blown away. “My Little Orange Kitten” is available as an instant download at Darcy’s Etsy Shop. 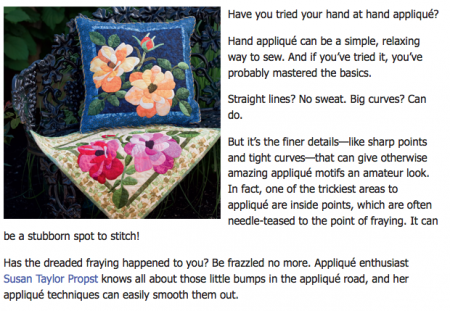 The wonderful Kim Jamieson-Hirst has launched her Essential Guide to Fusible Web Appliqué at Curious.com! This is the most comprehensive on-line course imaginable, including over 20 lessons that will show you everything you ever wanted to know about fusible web appliqué. You won’t believe how complete it is, with exercises and assignments and personalized teacher feedback. I’ve know Kim over the interweb for years now and I can tell you there isn’t a more pleasant person that you’ll meet. My favorite feature is that there are 172 minutes of learning-packed video “that isn’t sleep-inducing.” I love that LOL! Go on over to Curious.com and check out all the many features of the course. There’s a new internet special on my website. 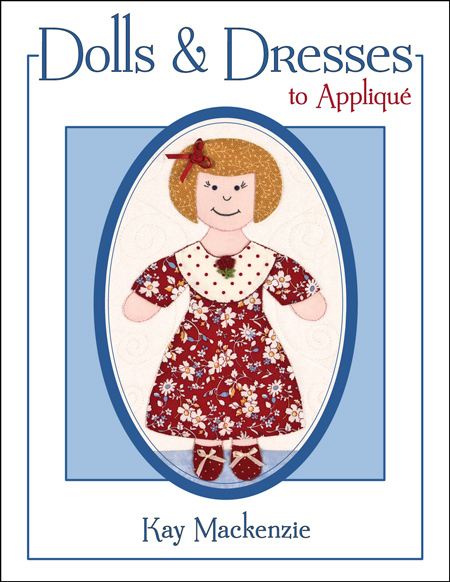 The BOGO book is now Dolls & Dresses to Appliqué. It comes free with any other book purchase at kaymackenzie.com, including the ones that are on overstock sale! I don’t believe I’ve mentioned here that for the past year or so I’ve been having the most fun with buttons. Oh my gosh, I’m in deep. 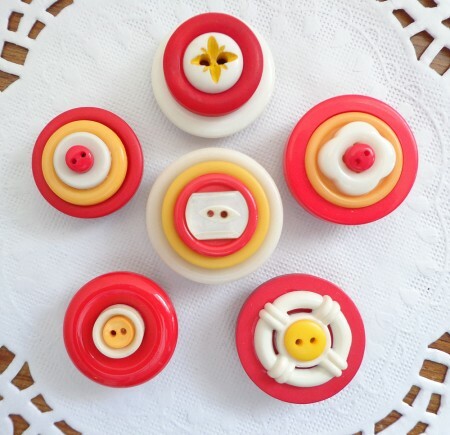 Introducing Kay’s one-of-a-kind Button Magnet Sets, available at my Etsy shop. They make fantastic gifts, for a friend or for yourself. Lastly, I’ll be at the Santa Clara Valley Quilt Association’s biannual show this weekend, at the Convention Center. Hope to see you there if you’re in NorCal! Inside points, notches, whatever you call ’em, hand appliquér extraordinaire Susan Taylor Propst has posted an illustrated tutorial to stitching these potentially pesky areas, over on the Martingale blog. And, my pal Cathy put up a post on machine quilting that is hilarious and inspired, with a touch of genius, and at once bittersweet if you are a Trekker or even an MI fan.